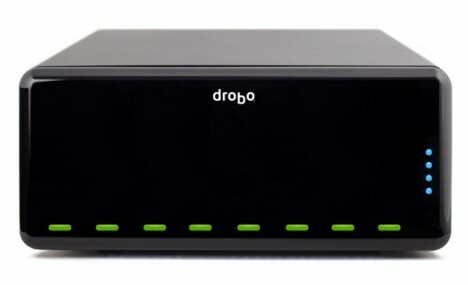 The well-known NAS (Network-attached storage) manufacturer, Data Robotics, today rolled out an advanced version of its popular NAS, Drobo, called Drobo Pro. Drobo was introduced in 2007 and it received positive response from small businesses to corporate customers and even the US government. Priced at $1300, Drobo Pro does not come cheap. Using the same genius BeyondRAID intelligent data storage technology, the new Drobo Pro is bigger and more muscular. It is equipped with 8 drives, for a start. This device connects to your network via iSCSI (ethernet), Firewire 800 or USB 2 and supports up to 8 3.5-inch SATA drives for a maximum of 16TB of storage. Drobo Pro is also featured with iSCSI which runs file storage info over Ethernet with nice speedy transfers (~100MB/s).